Sie erhalten eine Mischung aus verschiedenen Fuzzy Stoff Stickern deren Motive vom Bild abweichen können. Vielen Dank! Sandylion ALPHABET Stickers. YOUR CREATIVE POSSIBILITIES ARE ENDLESS! Stickers add sass, panache, and a dash of glam to your projects. Sandylion HEARTS AND ROSES Stickers. 1 Square Strip Approx 2" x 2", 6 pcs on Strip. YOUR CREATIVE POSSIBILITIES ARE ENDLESS! Stickers add sass, panache, and a dash of glam to your projects. SQUARE IS 2 1/4" x 2" WITH 3 RETIRED STICKERS FOR SCRAPBOOK PAGES, CARDS, PROJECTS OR COLLECTIONS. SANDYLION LOGO ON BACK. STRIP IS 3 1/4" x 2" WITH 2 HOUSE & 16 CANDY STICKERS FOR ANY OF YOUR PROJECTS. 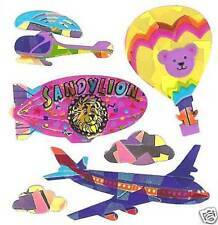 Prismatic Sandylion Logo Hot Air Balloon Travel. Original Logo on Hot Air Balloon! A Must Have! (1 square) 6 Stickers PER SQUARE. Free bonus stickers with every order. YOUR CREATIVE POSSIBILITIES ARE ENDLESS! Stickers add sass, panache, and a dash of glam to your projects. NONE OF OUR INVENTORY IS REFURBISHED. Je 1 Maxi Buchstaben Zahlen pearly von Sandylion 🦁🦁🦁🦁🦁🦁🦁🦁🦁🦁🦁🦁🦁🦁🦁🦁🦁🦁🦁 Bei mehreren Artikeln nur einmal Porto. Bitte Gesamtrechnung abwarten. Zuviel gezahltes Porto kann ich leider nicht zurückerstattet werden. For international buyers: Please wait for total invoice in case of you have to pay more than 4,50 Euros shipping. Since the beginnig of this year something has changed with our German Post. "Einschreiben" does no longer exist for commercial sellers. That means that we have to ship the stickers via "Warenpost" . Unfortunately it takes a few days longer than before until the stickers arrive. Sandylion HEARTS PATTERNED PRISMATIC Stickers. 3 Squares Strip Approx 2" x 6", 21 pcs on Strip. YOUR CREATIVE POSSIBILITIES ARE ENDLESS! Stickers add sass, panache, and a dash of glam to your projects. Sandylion TINY CATS Stickers. 1 Square Strip Approx 2" x 2", 12 pcs on Strip. YOUR CREATIVE POSSIBILITIES ARE ENDLESS! Stickers add sass, panache, and a dash of glam to your projects. 1 Abriss süße Tiere aus Stoff 🦁🦁🦁🦁🦁🦁🦁🦁🦁🦁🦁🦁🦁🦁🦁🦁🦁🦁🦁 Bei mehreren Artikeln nur einmal Porto. Bitte Gesamtrechnung abwarten. Rücknahme 1 Monat. For international buyers: Please wait for total invoice in case of you have to pay more than 4,50 Euros shipping. Since the beginnig of this year something has changed with our German Post. "Einschreiben" does no longer exist for commercial sellers. That means that we have to ship the stickers via "Warenpost" . Unfortunately it takes a few days longer than before until the stickers arrive. You will receive 03 squares of Sandylion. BABY GIRL scrapbooking stickers. Each square is approx. 2"x2" with 10 stickers. 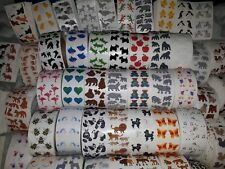 STRIP IS 6 1/2" x 2" WITH STICKERS FROM 1/4" TO 3/4" FOR YOUR SCRAPBOOK PAGES, CARDS OR ANY PROJECT. Sandylion FLAG STARS Stickers. 1 Square Strip Approx 2" x 2", 9 pcs on Strip. YOUR CREATIVE POSSIBILITIES ARE ENDLESS! Stickers add sass, panache, and a dash of glam to your projects. NONE OF OUR INVENTORY IS REFURBISHED. SQUARE IS 2 1/8" x 2" WITH 5 STICKERS FOR SCRAPBOOK PAGES, CARDS OR ANY PROJECT. SQUARE IS 2 1/4" x 2" WITH 5 STICKERS FOR SCRAPBOOK PAGES, CARDS OR ANY PROJECT. Sandylion PINK FLAMINGO PRISMATIC Stickers. 1 Square Strip Approx 2" x 2", 5 pcs on Strip. YOUR CREATIVE POSSIBILITIES ARE ENDLESS! Stickers add sass, panache, and a dash of glam to your projects. SQUARE IS 2 1/8" x 2" WITH 5 STICKERS FOR SCRAPBOOK PAGES, CARDS OR ANY PROJECT. VERY RARE SANDYLION LOGO ON BACK. SQUARE IS 2 1/8" x 2" WITH 7 STICKERS FOR SCRAPBOOK PAGES, CARDS OR ANY PROJECT. VERY RARE SANDYLION LOGO ON BACK. Sandylion Essentials WHITE ROSES Stickers. YOUR CREATIVE POSSIBILITIES ARE ENDLESS! Stickers add sass, panache, and a dash of glam to your projects. Let us make your experience 5 ,WE TRULY DO CARE. SQUARE IS 2 1/2" x 2" WITH 6 OPAL STICKERS FOR SCRAPBOOK PAGES, CARDS OR ANY PROJECT. OLD SANDYLION LOGO ON BACK. Sie erhalten eine Mischung aus verschiedenen Pearly Stickern deren Motive vom Bild abweichen können. Das Bild ist lediglich ein Beispielbild. Vielen Dank! SANDYLION HEARTS, MINI 1 SQUARE OF RETIRED MULTI COLORS OF STICKERS. SQUARE IS 2" x 2" WITH 1/4" HEART STICKERS FOR YOUR SCRAPBOOK PAGES, CARDS, PROJECTS OR COLLECTION. SANDYLION LOGO ON BACK. Sandylion TINY HALLOWEEN BLACK CATS Stickers. 1 Square Strip Approx 2" x 2", 9 pcs on Strip. YOUR CREATIVE POSSIBILITIES ARE ENDLESS! Stickers add sass, panache, and a dash of glam to your projects.